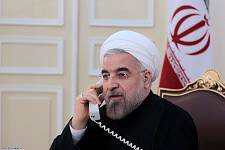 Today, presidents, prime ministers and government representatives from 100 countries arrived in Tehran to attend Iran’s president-elect Sheikh Hassan Rouhani’s inauguration ceremony at the Iranian Majlis (parliament). On Thursday, Iran’s Supreme Leader Ayatullah Ali Khamenei endorsed Sheikh Hassan Rouhani as country’s new President. The first president to land at Tehran’s Imam Khomeini International Airport on Tuesday was Zimbabwe president Robert Mugabe. He was followed by Afghan president Ashraf Ghani, and former president Hamid Karazai, Serzh Sargsyan, president on Armenia, president Igor Dodon of Moldova, Fuad Masum, president of Iraq – and government ministers from Russia, China, Britain, Germany, Qatar, North Korea, South Africa, Pakistan, India, Syria, Swaziland, Italy, France, Austria, Bosnia, Czech Republic, Denmark, Austria, Lebanon, and Turkey. The European Union foreign policy chief Federica Mogherini is also in Tehran to attend the swearing-in-ceremony for Iran’s president-elect Sheikh Hassan Rouhani. Sheikh Naim Qassem, deputy leader of Lebanese Islamic Resistance Hizbullah and Ramadan Abdullah Shallah, the secretary-general of Palestinian resistance Islamic Jihad arrived on Friday to attend the event. Former Iranian president Mahmoud Ahmadinejad also attended the ceremony. Overall, eight presidents, 19 parliament speakers, nine vice presidents and prime ministers, seven parliament vice-speakers, 11 foreign ministers and 46 special envoys from different countries are attending the ceremony. Listen below president Sheikh Hassan Rouhani’s inauguration speech. On August 2, 2017, Judas-goat Donald Trump signed a wide-ranging piece of legislation, the Countering America’s Adversaries Through Sanctions Act, which expands existing sanctions and imposes new ones on Russia, Iran, and North Korea. The legislation was overwhelmingly approved by the House of Representatives and the Senate on July 27, 2017. This entry was posted in Muslim World News and tagged Iran. Bookmark the permalink.